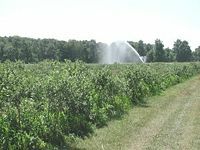 Irrigation of a field in New Jersey in the United States. Irrigation is an artificial application of water to the soil, usually to assist with the growth of crops. In crop production, it is mainly used in dry areas and in periods of rainfall shortfalls, but also to protect plants against frost. Additionally, irrigation helps suppress weed growing in rice fields. By contrast, agriculture that relies only on direct rainfall is referred to as rain-fed farming. Irrigation is often studied together with drainage, which is the natural or artificial removal of surface and sub-surface water from a given area. Irrigation is also a term used in the medical/dental fields and refers to flushing and washing out anything with water or another liquid. This article focuses on irrigation of the soil for agricultural purposes. 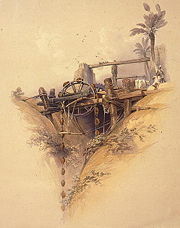 Animal-powered irrigation, Upper Egypt, around 1840. An example of irrigation system common on the Indian subcontinent. Artist's impression on the banks of Dal Lake, Kashmir, India. Inside a karez tunnel at Turpan, China. Archaeological investigation has identified evidence of irrigation in Mesopotamia and Egypt as far back as the sixth millennium B.C.E., where barley was grown in areas where the natural rainfall was insufficient to support such a crop. In the Zana Valley of the Andes Mountains in Peru, archaeologists found remains of three irrigation canals radiocarbon dated from the fourth millennium B.C.E., the third millennium B.C.E., and the ninth century C.E. These canals are the earliest record of irrigation in the New World. Traces of a canal possibly dating from the fifth millennium B.C.E. were found under the fourth millennium canal. Sophisticated irrigation and storage systems were developed by the Indus Valley Civilization in Pakistan and North India, including the reservoirs at Girnar in 3000 B.C.E. and an early canal irrigation system from circa 2600 B.C.E. Large scale agriculture was practiced and an extensive network of canals was used for the purpose of irrigation. There is evidence of the ancient Egyptian pharaoh Amenemhet III in the twelfth dynasty (about 1800 B.C.E.) using the natural lake of the Faiyum Oasis as a reservoir to store surpluses of water for use during the dry seasons, as the lake swelled annually as caused by the annual flooding of the Nile. The Qanats, developed in ancient Persia in about 800 B.C.E., are among the oldest known irrigation methods still in use today. They are now found in Asia, the Middle East and North Africa. The system comprises a network of vertical wells and gently sloping tunnels driven into the sides of cliffs and steep hills to tap groundwater. The noria, a water wheel with clay pots around the rim powered by the flow of the stream (or by animals where the water source was still), was first brought into use at about this time, by Roman settlers in North Africa. By 150 B.C.E., the pots were fitted with valves to allow smoother filling as they were forced into the water. The irrigation works of ancient Sri Lanka, the earliest dating from about 300 B.C.E., in the reign of King Pandukabhaya and under continuous development for the next thousand years, were one of the most complex irrigation systems of the ancient world. In addition to underground canals, the Sinhalese were the first to build completely artificial reservoirs to store water. The system was extensively restored and further extended during the reign of King Parakrama Bahu (1153 – 1186 C.E.). The oldest known hydraulic engineers of China were Sunshu Ao (sixth century B.C.E.) of the Spring and Autumn Period and Ximen Bao (fifth century B.C.E.) of the Warring States period, both of whom worked on large irrigation projects. In the Szechwan region belonging to the State of Qin of ancient China, the Dujiangyan Irrigation System was built in 256 B.C.E. to irrigate an enormous area of farmland that today still supplies water. By the first century C.E., during the Han Dynasty, the Chinese also used chain pumps that lifted water from lower elevation to higher elevation. These were powered by manual foot pedal, hydraulic waterwheels, or rotating mechanical wheels pulled by oxen. The water was used for public works of providing water for urban residential quarters and palace gardens, but mostly for irrigation of farmland canals and channels in the fields. In fifteenth-century Korea, the world's first water gauge, woo ryang gyae (Korean:우량계), was discovered in 1441 C.E. The inventor was Jang Young Sil, a Korean engineer of the Choson Dynasty, under the active direction of the King, Se Jong. It was installed in irrigation tanks as part of a nationwide system to measure and collect rainfall for agricultural applications. With this instrument, planners and farmers could make better use of the information gathered in the survey. At the global scale, 2,788,000 km² (689 million acres) of agricultural land was equipped with irrigation infrastructure around the year 2000. About 68 percent of the area equipped for irrigation is located in Asia, 17 percent in America, 9 percent in Europe, 5 percent in Africa and 1 percent in Oceania. The largest contiguous areas of high irrigation density are found in North India and Pakistan along the rivers Ganges and Indus, in the Hai He, Huang He and Yangtze basins in China, along the Nile river in Egypt and Sudan, in the Mississippi-Missouri river basin and in parts of California. Smaller irrigation areas are spread across almost all populated parts of the world. Basin flood irrigation of wheat. In surface irrigation systems water moves over and across the land by simple gravity flow in order to wet it and to infiltrate into the soil. Surface irrigation can be subdivided into furrow, borderstrip or basin irrigation. It is often called flood irrigation when the irrigation results in flooding or near flooding of the cultivated land. Historically, this has been the most common method of irrigating agricultural land. Where water levels from the irrigation source permit, the levels are controlled by dikes, usually plugged by soil. This is often seen in terraced rice fields (rice paddies), where the method is used to flood or control the level of water in each distinct field. In some cases, the water is pumped, or lifted by human or animal power to the level of the land. Localized irrigation is a system where water is distributed under low pressure through a piped network, in a pre-determined pattern, and applied as a small discharge to each plant or adjacent to it. Drip irrigation, spray or micro-sprinkler irrigation and bubbler irrigation belong to this category of irrigation methods. Deep percolation, where water moves below the root zone, can occur if a drip system is operated for too long of a duration or if the delivery rate is too high. Drip irrigation methods range from very high-tech and computerized to low-tech and labor-intensive. Lower water pressures are usually needed than for most other types of systems, with the exception of low energy center pivot systems and surface irrigation systems, and the system can be designed for uniformity throughout a field or for precise water delivery to individual plants in a landscape containing a mix of plant species. Although it is difficult to regulate pressure on steep slopes, pressure compensating emitters are available, so the field does not have to be level. High-tech solutions involve precisely calibrated emitters located along lines of tubing that extend from a computerized set of valves. Both pressure regulation and filtration to remove particles are important. The tubes are usually black (or buried under soil or mulch) to prevent the growth of algae and to protect the polyethylene from degradation due to ultraviolet light. But drip irrigation can also be as low-tech as a porous clay vessel sunk into the soil and occasionally filled from a hose or bucket. Subsurface drip irrigation has been used successfully on lawns, but it is more expensive than a more traditional sprinkler system. Surface drip systems are not cost-effective (or aesthetically pleasing) for lawns and golf courses. In the past one of the main disadvantages of the subsurface drip irrigation (SDI) systems, when used for turf, was the fact of having to install the plastic lines very close to each other in the ground, therefore disrupting the turfgrass area. Recent technology developments on drip installers like the drip installer at New Mexico State University Arrow Head Center, places the line underground and covers the slit leaving no soil exposed. In sprinkler or overhead irrigation, water is piped to one or more central locations within the field and distributed by overhead high-pressure sprinklers or guns. A system utilizing sprinklers, sprays, or guns mounted overhead on permanently installed risers is often referred to as a solid-set irrigation system. Higher pressure sprinklers that rotate are called rotors and are driven by a ball drive, gear drive, or impact mechanism. Rotors can be designed to rotate in a full or partial circle. Guns are similar to rotors, except that they generally operate at very high pressures of 40 to 130 lbf/in² (275 to 900 kPa) and flows of 50 to 1200 US gal/min (3 to 76 L/s), usually with nozzle diameters in the range of 0.5 to 1.9 inches (10 to 50 mm). Guns are used not only for irrigation, but also for industrial applications such as dust suppression and logging. A traveling sprinkler at Millets Farm Centre, Oxfordshire, UK. Sprinklers may also be mounted on moving platforms connected to the water source by a hose. Automatically moving wheeled systems known as traveling sprinklers may irrigate areas such as small farms, sports fields, parks, pastures, and cemeteries unattended. Most of these utilize a length of polyethylene tubing wound on a steel drum. As the tubing is wound on the drum powered by the irrigation water or a small gas engine, the sprinkler is pulled across the field. When the sprinkler arrives back at the reel the system shuts off. This type of system is known to most people as a "waterreel" traveling irrigation sprinkler and they are used extensively for dust suppression, irrigation, and land application of waste water. Other travelers use a flat rubber hose that is dragged along behind while the sprinkler platform is pulled by a cable. These cable-type travelers are definitely old technology and their use is limited in today's modern irrigation projects. The hub of a center-pivot irrigation system. Center pivot irrigation is a form of sprinkler irrigation consisting of several segments of pipe (usually galvanized steel or aluminum) joined together and supported by trusses, mounted on wheeled towers with sprinklers positioned along its length. The system moves in a circular pattern and is fed with water from the pivot point at the center of the arc. These systems are common in parts of the United States where terrain is flat. Center pivot with drop sprinklers. Photo by Gene Alexander, USDA Natural Resources Conservation Service. Most center pivot systems now have drops hanging from a u-shaped pipe called a gooseneck attached at the top of the pipe with sprinkler heads that are positioned a few feet (at most) above the crop, thus limiting evaporative losses. Drops can also be used with drag hoses or bubblers that deposit the water directly on the ground between crops. The crops are planted in a circle to conform to the center pivot. This type of system is known as LEPA (Low Energy Precision Application). Originally, most center pivots were water powered. These were replaced by hydraulic systems (T-L Irrigation) and electric motor driven systems (Lindsay, Reinke, Valley, Zimmatic, Pierce, Grupo Chamartin. Most systems today are driven by an electric motor mounted low on each span. This drives a reduction gearbox and transverse driveshafts transmit power to another reduction gearbox mounted behind each wheel. Precision controls, some with GPS location and remote computer monitoring, are now available. 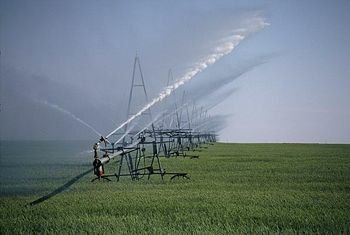 Wheel line irrigation system in Idaho. 2001. Photo by Joel McNee, USDA Natural Resources Conservation Service. A series of pipes, each with a wheel of about 1.5 m diameter permanently affixed to its midpoint and sprinklers along its length, are coupled together at one edge of a field. Water is supplied at one end using a large hose. After sufficient water has been applied, the hose is removed and the remaining assembly rotated either by hand or with a purpose-built mechanism, so that the sprinklers move 10 m across the field. The hose is reconnected. The process is repeated until the opposite edge of the field is reached. This system is less expensive to install than a center pivot, but much more labor intensive to operate, and it is limited in the amount of water it can carry. Most systems utilize 4 or 5-inch (130 mm) diameter aluminum pipe. One feature of a lateral move system is that it consists of sections that can be easily disconnected. They are most often used for small or oddly-shaped fields, such as those found in hilly or mountainous regions, or in regions where labor is inexpensive. Subirrigation also sometimes called seepage irrigation has been used for many years in field crops in areas with high water tables. It is a method of artificially raising the water table to allow the soil to be moistened from below the plants' root zone. Often those systems are located on permanent grasslands in lowlands or river valleys and combined with drainage infrastructure. A system of pumping stations, canals, weirs and gates allows it to increase or decrease the water level in a network of ditches and thereby control the water table. Sub-irrigation is also used in commercial greenhouse production, usually for potted plants. Water is delivered from below, absorbed upwards, and the excess collected for recycling. Typically, a solution of water and nutrients floods a container or flows through a trough for a short period of time, 10-20 minutes, and is then pumped back into a holding tank for reuse. Sub-irrigation in greenhouses requires fairly sophisticated, expensive equipment and management. Advantages are water and nutrient conservation, and labor-saving through lowered system maintenance and automation. It is similar in principle and action to subsurface drip irrigation. These systems have low requirements for infrastructure and technical equipment but need high labor inputs. Irrigation using watering cans is to be found for example in peri-urban agriculture around large cities in some African countries. Besides the common manual watering by bucket, an automated, natural version of this also exist. Using plain polyester ropes combined with a prepared ground mixture can be used to water plants from a vessel filled with water. The ground mixture would need to be made depending on the plant itself, yet would mostly consist of black potting soil, vermiculite and perlite. This system would (with certain crops) allow you to save expenses as it does not consume any electricity and only little water (unlike sprinklers, water timers, …). However, it may only be used with certain crops (probably mostly larger crops that do not need a humid environment). In countries where at night, humid air sweeps the countryside, stones are used to catch water from the humid air by condensation. This is for example practiced in the vineyards at Lanzarote. In subtropical countries as Mali and Senegal, a special type of terracing (without flood irrigation or intent to flatten farming ground) is used. Here, a 'stairs' is made through the use of ground level differences which helps to decrease water evaporation and also distributes the water to all patches (sort of irrigation). Sources of irrigation water can be groundwater extracted from springs or by using wells, surface water withdrawn from rivers, lakes or reservoirs or non-conventional sources like treated wastewater, desalinated water or drainage water. A special form of irrigation using surface water is spate irrigation, also called floodwater harvesting. In case of a flood (spate) water is diverted to normally dry river beds (wadi’s) using a network of dams, gates and channels and spread over large areas. The moisture stored in the soil will be used thereafter to grow crops. Spate irrigation areas are in particular located in semi-arid or arid, mountainous regions. While floodwater harvesting belongs to the accepted irrigation methods, rainwater harvesting is usually not considered as a form of irrigation. Rainwater harvesting is the collection of runoff water from roofs or unused land and the concentration of this water on cultivated land. Therefore this method is considered as a water concentration method. Most commercial and residential irrigation systems are "in ground" systems, which means that everything is buried in the ground. With the pipes, sprinklers, and irrigation valves being hidden, it makes for a cleaner, more presentable landscape without garden hoses or other items having to be moved around manually. The beginning of a sprinkler system is the water source. This is usually a tap into an existing (city) water line or a pump that pulls water out of a well or a pond. The water travels through pipes from the water source through the valves to the sprinklers. The pipes from the water source up to the irrigation valves are called "mainlines," and the lines from the valves to the sprinklers are called "lateral lines." Most piping used in irrigation systems today are HDPE and MDPE or PVC or PEX plastic pressure pipes due to their ease of installation and resistance to corrosion. After the water source, the water usually travels through a check valve. This prevents water in the irrigation lines from being pulled back into and contaminating the clean water supply. Most irrigation systems are divided into zones. A zone is a single Irrigation Valve and one or a group of sprinklers that are connected by pipes. Irrigation Systems are divided into zones because there is usually not enough pressure and available flow to run sprinklers for an entire yard or sports field at once. Each zone has a solenoid valve on it that is controlled via wire by an Irrigation Controller. The Irrigation Controller is either a mechanical or electrical device that signals a zone to turn on at a specific time and keeps it on for a specified amount of time. "Smart Controller" is a recent term used to describe a controller that is capable of adjusting the watering time by itself in response to current environmental conditions. The smart controller determines current conditions by means of historic weather data for the local area, a moisture sensor (water potential or water content), weather station, or a combination of these. Depletion of underground aquifers. By the middle of the twentieth century, the advent of diesel and electric motors led for the first time to systems that could pump groundwater out of major aquifers faster than it was recharged. This can lead to permanent loss of aquifer capacity, decreased water quality, ground subsidence, and other problems. The future of food production in such areas as the North China Plain, the Punjab, and the Great Plains of the US is threatened. Ground subsidence (as in New Orleans, Louisiana). Underirrigation gives poor salinity control which leads to increased soil salinity with consequent build up of toxic salts on soil surface in areas with high evaporation. This requires either leaching to remove these salts and a method of drainage to carry the salts away or use of mulch to minimize evaporation. Overirrigation because of poor distribution uniformity or management wastes water and chemicals, and may lead to water pollution. Deep drainage (from over-irrigation) may result in rising water tables which in some instances will lead to problems of irrigation salinity. Irrigation with saline or high-sodium water may damage soil structure. Competition for surface water rights. ↑ The History of Technology – Irrigation. Encyclopædia Britannica, 1994 ed. ↑ T.D. Dillehay, H.H. Eling Jr., and J. Rossen. 2005. Preceramic irrigation canals in the Peruvian Andes. Proceedings of the National Academy of Sciences 102(47):17241–17244. ↑ J.C. Rodda and Lucio Ubertini. 2004. The Basis of Civilization - Water Science? (Wallingford, Oxfordshire, UK: International Association of Hydrological Science. ISBN 9781901502572), 161. ↑ Ancient India Indus Valley Civilization. Minnesota State University "e-museum." Retrieved February 16, 2009. ↑ Qanat Irrigation Systems and Homegardens (Iran). UN Food and Agriculture Organization. Retrieved February 16, 2009. ↑ Encyclopædia Britannica, 1911 and 1989 editions. ↑ Sena de Silva, 1998. Reservoirs of Sri Lanka and their fisheries. UN Food and Agriculture Organization. Retrieved February 16, 2009. ↑ China – history. Encyclopædia Britannica, 1994 ed. ↑ Joseph Needham. 1986. Science and Civilization in China: Volume 4, Physics and Physical Technology, Part 2, Mechanical Engineering. (Taipei, TW: Caves Books Ltd.), 344-346. ↑ S. Siebert, J. Hoogeveen, P. Döll, J-M. Faurès, S. Feick, and K. Frenken. 2006. The Digital Global Map of Irrigation Areas – Development and Validation of Map Version 4. Tropentag 2006 – Conference on International Agricultural Research for Development. (Bonn, Germany). Retrieved February 16, 2009. ↑ K. Frenken, 2005. "Water Report 29" in Irrigation in Africa in figures – AQUASTAT Survey – 2005. (Rome, IT: Food and Agriculture Organization of the United Nations. ISBN 9251054142). Retrieved February 16, 2009. ↑ polyester ropes natural irrigation technique. entheogen.com. Retrieved February 16, 2009. ↑ Polyester rope natural irrigation technique 2. diyrecipes.com. Retrieved February 16, 2009. ↑ Self watering recycled plant pot for growing herbs and flowers. instructables.com. Retrieved February 16, 2009. Frenken, K. 2005. "Water Report 29," in Irrigation in Africa in figures – AQUASTAT Survey – 2005. Rome, IT: Food and Agriculture Organization of the United Nations. ISBN 9251054142. Keesan, Larry, and Cindy Code. 1995. The Complete Irrigation Workbook: Design, Installation, Maintenance & Water Management. Cleveland, OH: Franzak & Foster. ISBN 1883751012. Needham, Joseph. 1986. Science and Civilization in China: Volume 4, Physics and Physical Technology, Part 2, Mechanical Engineering. Taipei, TW: Caves Books Ltd.
Rodda, J.C. and Ubertini, Lucio. 2004. The Basis of Civilization - Water Science? Wallingford, Oxfordshire, UK: International Association of Hydrological Science. ISBN 9781901502572. Irrigation Science. Berlin, DE: Heidelberg Springer. ISSN: 1432-1319 (electronic) 0342-7188 (paper). Journal of Irrigation and Drainage Engineering. New York, NY: American Society of Civil Engineers (ASCE) Publications. ISSN: 0733-9437. This page was last modified on 6 March 2018, at 19:09.